HomeAll postsLatestWhy do we live in a culture that venerates stress? There’s a woman in the doctor’s waiting room. Her eyes dart around as though there is something else she needs to do, and she is hunting for clues as to what it might be. Her teenage son is showing signs of anxiety, she says. She worries about him all the time, and when he says he hates himself, she gets upset, and then she gets angry with herself for getting upset. Telling people you’ve been involved in a documentary on stress is a bit like telling them you’re pregnant, I’ve discovered. Everyone has a story. Hers is a familiar one. Stress is an old friend. It sneaks in at night, hissing in the darkness about her imperfections, her failings, all the ways in which she is not up to the mark. I was driving somewhere the other day, she says, and I had tears streaming down my cheeks, and I didn’t even know what I was crying about. I meet a man at a party who knows all about stress. A few years ago, he found himself under pressure at work. To the outside world, it must have looked like he had it all: a great job, a loving family. But inside he was falling apart. He would work late; sleep in short, dreamless bursts; wake up feeling exhausted and pulsing with dread. His mind was so flooded with cortisol that he sometimes found himself unable to finish sentences. He knew he was making poor decisions. I thought I was developing dementia, he says. I was actually burning out. There’s another, younger woman, who is measuring herself by everyone else’s expectations, and the perfect lives she sees others leading on social media. She knows those flawless, filtered lives are an illusion. She understands that social media is engineered to exploit our inadequacies, but she can’t stop looking, and the more she looks, the worse she feels. Some stress is unavoidable. A certain amount of it, at the right moment and for short periods, can even help us to get stuff done. But chronic stress is an insidious beast. It wreaks havoc on our sleep, our mood, our faculty for making good decisions, our ability to relate to others and their problems. Exposure to it in the long term is linked to heart disease, depression and type 2 diabetes. And yet, we live in a culture that venerates stress. The old status symbols used to be a fancy job title, a nice car, a big house. 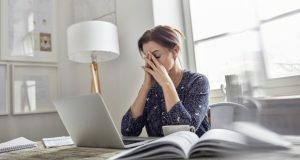 Those things still matter, but the real symbols of achievement these days are the signs of chronic stress – the sleepless nights; the constantly buzzing phone; the emails sent at 10pm or 6am. There’s a reason those notification badges on our phones are red, the colour of threat and danger. Everywhere you look, people who should know better are glamourising the lifestyles of the perpetually stressed. How are you, we ask one another. Flat out, we reply happily. Shattered. Wrecked. It’s non-stop. Leo Varadkar wants to be the party for people who get up at 7am. Elon Musk recently talked about how he’s been sleeping on a couch at his office in California during production of the Tesla Model 3 Sedan. People were appalled: not because he’s sleeping at the office, but because the couch didn’t look all that comfortable. They didn’t sign a petition saying, “Elon, you’re already worth $20.1 billion. How much more do you need? Go home, get a grip, and get some rest.” Instead, they crowdfunded him a better couch. Almost two years ago, my family and I left our stressful lives and 9-to-midnight jobs in California for a better quality of life here. But stress is like damp in the fabric of the house. You have to deal with the root cause, or it will seep right back in. It turned out that changing my country of residency wasn’t enough: I had to change my whole mindset. In some ways, that was harder than moving continent. There was a mantra I kept repeating to myself during late nights in the blue glow of my laptop in San Jose, or when I was racing along the freeway, late again to collect my children from childcare, with to-do lists whirring in my head, and my phone vibrating in my pocket. There has to be a better way. There has to be a better way. For the past five months, I’ve been working on presenting a documentary series about stress. The producers wanted to explore the latest scientific thinking on how psychological therapies, diet, sleep and mindfulness can impact stress. This is what I’ve learned through the experience: you may not have much choice about the things in your life that put you under pressure, but you can choose how you react to them. We don’t have to live in a state of constant, ongoing stress. It’s not a non-negotiable part of adult life, a badge of honour, or just another side-effect of success. There is another way.